Website & webshop development | Different Fejlesztő Kft. When we stumble upon a new service on the internet, the first step is to check it’s associated website. No one wants to lose potential customers because of a poorly designed and maintained webpage. For a company, organization or project, a website is the 21st century’s virtual bussiness card. Indispensable. Our clients are greeted with customer focused attiude, tech expertise and flexibility, because we follow your project from planning to everyday operation. Your website will be informative, modern and fit your company identity seamlessly. We place utmost importance to recognize your goals and plans when asking for requirements. Our mission is to understand your needs and motives, to provide the solution you need. Our developers closely work together, to deliver websites that serve all your customers’ needs easily and securely. At the end of the development phase an extensive in-house testing happens, so the final product is as close to your needs as it can be. Creating a website is a big challenge, but reforming and modernizing an existing one is maybe even greater. Its important to preserve the current visitors, but new target audience is always important for the owners. After we completed our new development, the most exclusive fitness gym in Tatabánya now delivers outstanding experience for their customers not only in person, but also on the web. During our work we like to work on presenting services that represent something new on either national or international markerts. While working on the Tata a. website we placed importance on telling the visitors about short term rents and how can they benefit from it. We delivered a communicative and transparent website for our customer. Customers often search for custom solutions when contacting us. 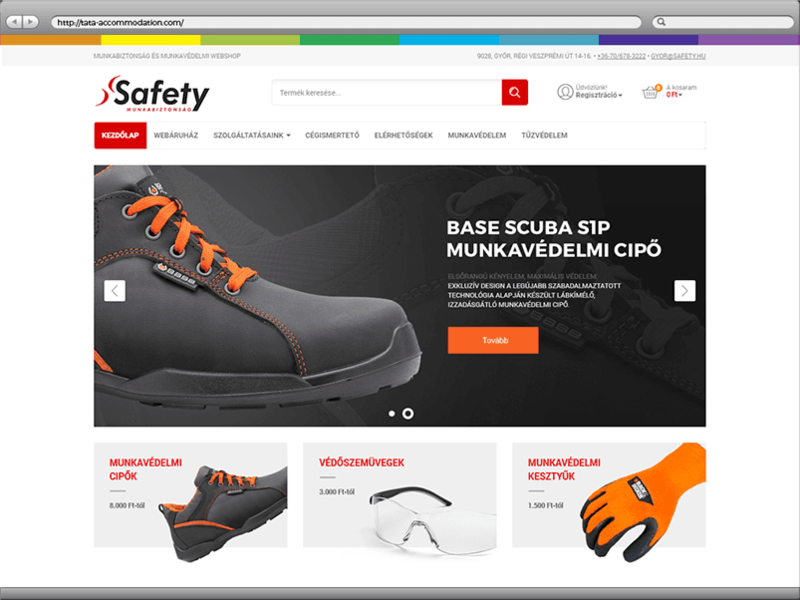 In the case of the Safety, our developers combined a website and webshop, delivering a complex end product, that not only provides information about legal regulations concerning occupational safety, but also enables visitors to purchase the necessary accessories and items to abide such regulations and provide the “safety” for their employees.